extended: Goodbye 2012, Welcome Inspiring 2013! Goodbye 2012, Welcome Inspiring 2013! New Year, new tricks! goes an old saying. What's your favourite New Year's tradition? Resolutions? Fireworks? Anything special to wipe away the old year and welcome the new one? Mine is definitely the New Year's lead pouring, an old Mid & Northern European tradition that, according to Wikipedia, travelled to Finland from Mid Europe via Sweden, at first for the New Year's Eve entertainment of the higher class. From 19th century it was done in most Finnish homes at the very end of 31st December to tell what the coming year would bring along. 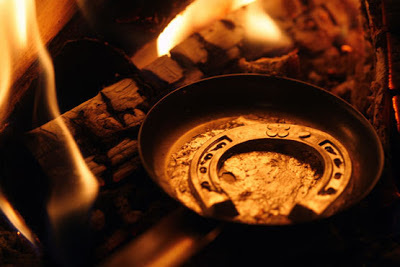 It goes like this: at first a horseshoe shaped lead piece is placed in a shallow metal scoop and heated on an open fire, or in the city conditions on an electric or a gas hob. When the solid lead turns into liquid - which happens very quickly - it's poured with fast twist of the wrist into a bucketful of cold water. Cold water turns the lead into a chunk of different shapes and textures. - Huh, quite a list already! To find out the rest click here and copy the Finnish Folklore Blog link into the left field. Select Finnish as the translate-from-language and hit the translate button. For the more down-to-earth crowd, including myself, it's just a great way to keep the whole family entertained while waiting for the year to change and also on the following day, at which stage the Christmassy board games have probably started to bore everyone to death. It's also a great way to stimulate one's imagination. 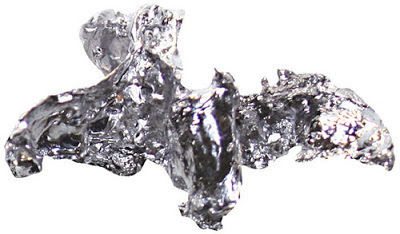 I used to pour lead at most New Year's Eves until my late teens and after that occasionally. At the legal drinking age and from it on it was even more fun than with one's family; we used to hire a log cabin or get together at someone's house for the New Year celebrations and keep on analyzing the lead chunks as long as the magnum bottle of bubbly - or a couple - was gone. I missed the latest event as I welcomed the 2013 at home in Ireland - the tight security control at Helsinki-Vantaa Airport wouldn't have let the lead horseshoes go through in my hand baggage. - but I might break the rules and do it this summer instead to find inspiration, new shapes and stories, for my new fashion/home collection! - Whilst getting to it I'm wishing 2013 is the best year ever for all! P.S: If you're under 18 or have never done the New Year's lead pouring and get your hands on the right kind of lead horse shoes, only try it under careful supervision of a person who's familiar with it. 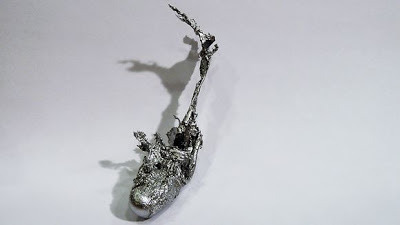 Also note, lead is hazardous waste so don't forget to dispose of it appropriately. What a curious tradition. Interesting post Heli.